This very new native red maple variety has much to offer. It has briliant red leaves in fall that slowly mature to a strong purple red over a remarkably long time. While not a columnar tree, it does offer a canopy size in keeping with today's properties, typically 25-30 feet tall by 12-15 feet wide (over a 12 year span). And as a male only variety, it bears no 'whirlybird' keys so common with most maple varieties. Suitable for all soil conditions including heavy clay. 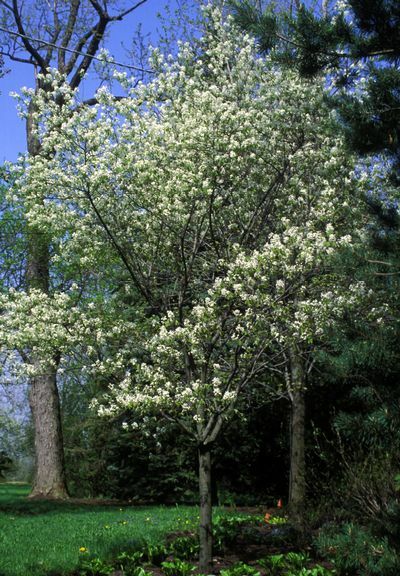 This lovely spring flowering tree offers the benefits of native serviceberry, but with a few improvements. As an Apple Serviceberry, it offers larger white blossoms that are tinged with pink, edible blue berries that attract birds, and a great show of yellow, orange and red leaves in the fall. It grows well in most soil conditions, including droughty and clayey, and will grow in either sunny or shady conditions to a height of 15 to 25 feet tall by the same wide. Catalpas are some of the most durable trees in the modern landscape, and it offers striking large heart shaped leaves. This is accented by towering fragrant white cone-shaped blossoms in late spring that are followed by long bean like pods for which catalpas are famous. 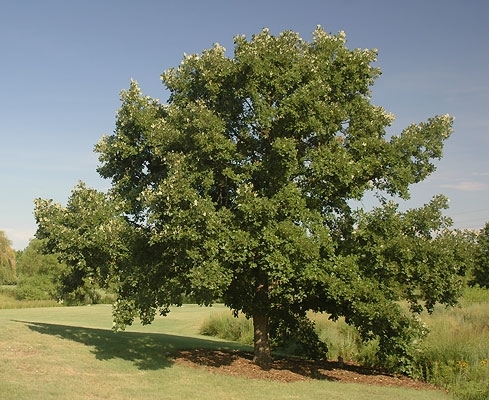 It tolerates most soil conditions, pollution, and becomes a shade tree with some haste, growing quickly to 30 feet tall by the same or more wide. Truly a unique tree for city conditions. This wonderful tree has much to offer homeowners. It offers deep purple new growth on a upright growing tree (growing 25 feet tall by about 20 feet wide) that turns medium green through the summer, and then a strikingly lovely apricot yellow in the fall. Katsuras also produce a distinctive sweet fragrance as the tree leaves are preparing to depart the tree, adding an extra rich dimension to the fall garden. Good for areas in sun or partial shade, it benefits from additional watering during hot summers while it roots in. 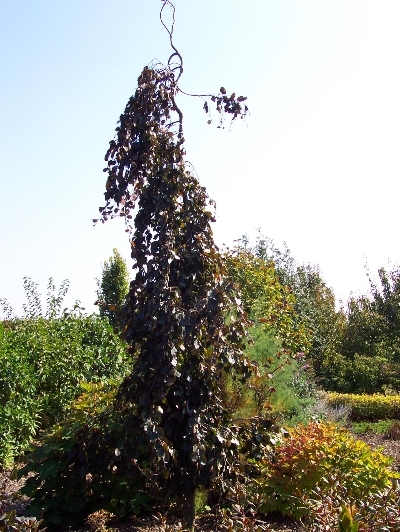 This striking beech with deep purple leaves grows in a dramatic slender weeping form to a height of 25 feet tall by 15 feet wide, making it an excellent accent tree for a smaller property. It grows best in full sun on well-drained soils, and is reasonably drought tolerant once it is established. This oak, in full leaf, is just a large beautiful shade tree growing 50-80 ft. tall. In the winter, when its knurled, twisting branches, distinctive ridged bark and bristly capped acorns can be clearly seen, it's a Show Stopper! Tolerant of poor soils and serious drought, it does not like constantly wet sites. Plant it wisely.it could live for over 200 years! This trouble-free slow-growing native is easily recognized by its flaking plates of brown bark. In early spring, both catkins and new leaves cover the branches at the same time with the 'hop-like' catkins becoming small nutlets enclosed in papery shells. Growing 35-40 ft. tall and 25 ft. wide, it thrives in sun to deep shade. Finally there is a flowering dogwood that we in K-W can grow successfully. Not only are its blooms enormous (up to 6 inches) and lovely, but it is superbly disease resistant, demonstrates fine winter hardiness, is drought tolerant, and has a low-branched, full habit that keeps it colorful right down to the ground. And as the fastest-growing Dogwood, it will grow up, fill out, and bloom spectacularly, all within a very few seasons. It grows full from low set branches to 20 feet tall by 30 feet wide. Showy red maple flowers herald spring on this tree, followed by dense dark green foliage that turns yellow with blushes of orange-red in the fall. Bred from native red maple, it offers the durability of a large native tree (it could reach to 50 ft tall) in a confined space (it will spread only to about 20 ft. wide). Suitable for most soil types, including heavy clay, it also offers a smooth, silver-gray bark that becomes deeply ridged with age. ** Available by special order. See also 'Armstrong Gold' maple. 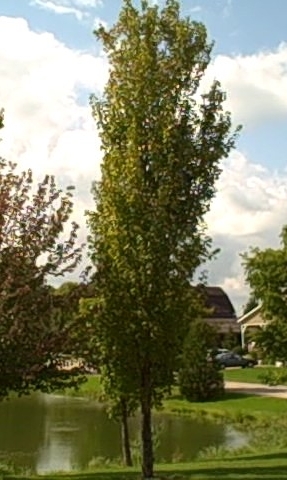 Hedge maple is one of the most drought tolerant and durable maple tree species available. 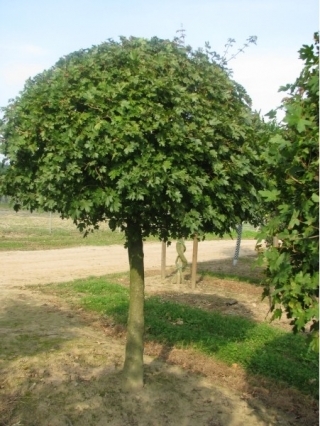 This refined cultivar grows slowly and forms a naturally forming oval to round head that can also be trimmed to any shape desired. Small maple like leaves are deep green all season, turning a dull brown come fall. This tree grows slowly to a height of 8 to 10 feet in height and diameter, in almost any soil condition. 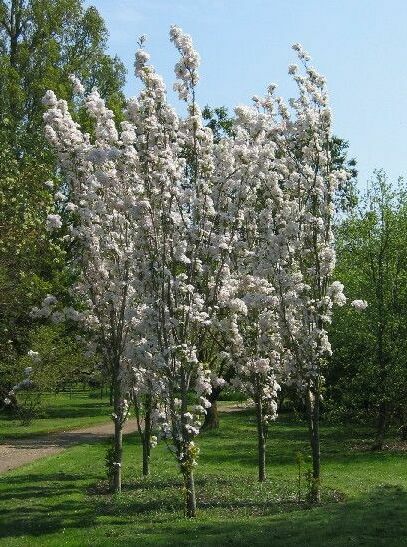 This hard to find columnar cherry offers a stunning display of soft pink double blossoms in mid-spring on an erect upright form. Bronze-green foliage appears shortly thereafter and remains somewhat glossy on the tree until fall when it turns a lovely burnt orangey yellow. It grows 15 to 25 feet tall by approximately 5 to 6 feet wide in full sun on well drained soil conditions (not clay).